After a surprising ninth-placed finish at the 2011 European Championship, Finland are hoping to take the next step internationally and a big help in that effort would come from a pair of U.S. born brothers. 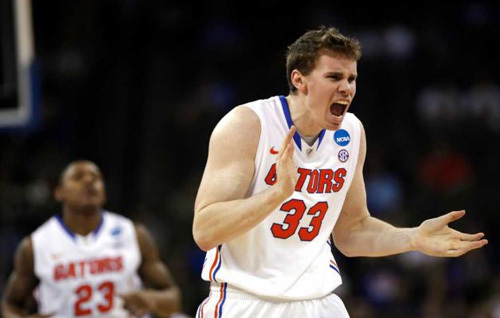 University of Florida power forward Erik Murphy and his younger brother Alex Murphy from Duke University both have Finnish passports and play an important role in the future plans of Finnish national team coach Henrik Dettmann. “I think it’s really, really great that they’re playing for Finland,” Dettmann told heinnews. Dettmann has been working hard to get the Murphys to commit to Finland, which is the homeland of their mother, Päivi Murphy. And Finland finally got their wish this past summer as Alex Murphy, who red-shirted last season in Durham and has four years of eligibility left, played for Finland for the first time at the Under-20 European Championship in Bulgaria and was an instant star. The 19-year-old wing player was Finland’s leading scorer with 17.4 ppg, rebounder with 6.6 rpg and shot blocker with 1.3 bspg over seven games while adding 1.4 assists and 1.1 steals. And he really stepped up his game in the final two games against Poland and Belgium as he scored 30 and 29 points respectively and grabbed 15 rebounds. “He’s a great player. He’s a great prospect. He has all the skills a basketball player needs to have. And of course he’s a complete player,” said Dettmann about Alex. That Alex and Erik are both great players is not really a surprise given their bloodlines. Their father Jay Murphy was a standout college basketball player for Boston College and then played 67 NBA games over four years from 1984 to 1988. He later would play in Europe including in France and Italy before retiring in 1995. And Murphy’s wife Päivi played professionally in Sweden and for the Finnish national team. The Murphys made sure their sons had a connection to Päivi’s homeland. “When I was young, we used to go over to Finland all the time,” Murphy was quoted on the Duke website prior to the U20 European Championship. And Dettmann feels the Murphy commitment to the Scandinavian country has been honest. “The whole family shows the respect towards the Finns; the mother, who is from Finland; and the Finnish society; and the Finnish basketball family,” said the coach. Dettmann reiterated however that the help is two-way as players from the States gain greatly from their experience playing in international competition. “On the other hand I think both of these players will benefit from this. They get to play international basketball. They get to play in a new environment, and they get more experience. These things are so valuable for them,” said Dettmann. “There were a lot of good teams there, some great players. The competition was much better than I thought it would be,” Alex said on the Duke website after the tournament. “Basketball is a worldwide game, but the style of play is so different over there. It’s more similar now, but it’s still a lot more physical when you get outside of the U.S.,” Murphy continued. Alex Murphy only had to listen to his coach at Duke about international experience as Duke head coach Mike Krzyzewski guided the U.S. national team to their second straight Olympic gold medal in London, sandwiched around his 2010 World Championship crown as well as four NCAA titles. “Coach K says it all the time, that the way we play here in the U.S. isn’t the only way to play the game. How much better is it overseas than it was 10 or 20 years ago? 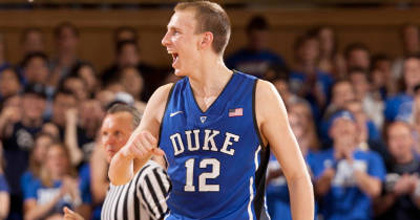 We can learn some things from them,” said Alex Murphy on the Duke site. And given the high level of both Murphy brothers, it’s pretty clear they both could play for the Finland senior team. And they both would be allowed to play. Though FIBA allows only one player naturalized after 17 years per national team, the Murphy brothers received their Finnish passports at a young age. “Alex was with the U20s, and we practiced with him a few times. He’s a great player. His basic skills are excellent. And he’s going to be a huge help,” said Finnish national team player Gerald Lee, an American-born Finn who played at Old Dominion from 2006 to 2010. Dettmann would have loved to have had both Murphy brothers this summer as Finland go through qualifications for the 2013 European Championship. The Finns have been drawn into Group E with Poland, Belgium, Albania and Switzerland – the top two teams advancing to Slovenia 2013. Dettmann said the Finns had discussed Erik – who turns 22 in October – joining the program but that Murphy’s studies did not allow it this summer. “I’m expecting Erik to be an even bigger help too. Playing in Florida under Billy Donovan. Great experience. What I’ve heard, he’s a hell of a player,” said Lee. What kind of coach and team wouldn’t want to have a 6-foot-8 wing and a 6-foot-10 power forward enter their program out of the blue? Well, how about a third Murphy brother? The 14-year-old Tomas Murphy is already around 6-foot-6 and considered a great talent. The future of Finnish basketball might just be in the hands of the Murphy family.